Repsol650 - WA Great Product "Has plenty of room for one helmet and more. i put a bunch of gloves and a helmet and a bike cover and it still all fits. Not much padding though so you can't literally throw it around and not expect your helmet to get damaged. Still very durable." 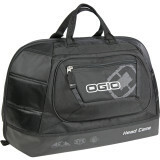 Hammerhead - Prairieville,LA Big Helmet Bag ! "Unlike the last bag we had, This one is big enough for the helmet and goggles and tearoffs plus alot more...."